The co-founders of Sledgehammer Games, the studio behind Call of Duty: WWII (pictured) and Advanced Warfare, have departed to take on new positions at publisher Activision. As reported by Kotaku, Glen Schofield and Michael Condrey have both moved to non-specified executive roles at Activision, with director of product development Aaron Halon taking on the top job at the Call of Duty developer. The studio was founded back in 2009, coming on board to help out on Call of Duty: Modern Warfare 3 by Activision following a fallout with Infinity Ward founders Jason West and Vince Zampella. 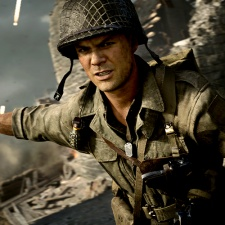 Sledgehammer made the leap from support studio to effectively leading the Call of Duty franchise with bold new steps in 2014's Advanced Warfare and WWII. "Following the incredible success of Call of Duty: WWII, Glen Schofield and Michael Condrey have decided to transition from their duties at Sledgehammer Games to new executive duties inside Activision," the publisher said in a statement. "We thank Glen and Michael for their tremendous body of work on Call of Duty and look forward to continuing to collaborate with them in their new roles. These changes have created an opportunity to elevate one of the key leaders at the studio, Aaron Halon, to lead Sledgehammer Games. Aaron is a founding member of Sledgehammer Games and the natural fit to lead the team. He has over 20 years of industry experience and has played an instrumental role throughout the studio’s history. We congratulate Aaron and are thrilled about the future of Sledgehammer Games, which we believe has even bigger days ahead." Schofield added: "Michael and I have been collaborating for over 12 years. In that time, we’ve made great games that fans have loved, won awards on behalf of our projects and have lived our dreams. We thank Activision for the wonderful opportunity to create and lead Sledgehammer Games. Now, it’s time to try other things. Activision has offered me the opportunity to focus my energy on something I’m very passionate about, exploring new game ideas for the company. It’s something I just couldn’t pass up. Working with such a great studio of developers at Sledgehammer Games has been an honor and the highlight of my career. The team is in great hands with Aaron, he has my full support and confidence. Thank you to everyone." Condrey continued, saying: "We founded Sledgehammer Games to bring together a world class development team with a singular goal of delivering excellence for fans. Over the course of nearly a decade, Glen and I proudly grew the studio and watched a new crop of leaders emerge within the team. On a personal level, I’m deeply grateful to the men and women who have poured their passion into the pursuit of excellence with us. I’m proud of what we accomplished together, it has been the greatest experience of my professional life. I am looking forward to starting a new chapter of my career with Activision. I couldn’t be more excited for the future of Sledgehammer Games and look forward to seeing Aaron lead the studio to new heights."